The NCAA has announced the second and third round sites plus the regional sites for the 2014 and the 2015 NCAA Tournaments and you may notice a pretty famous arena hosting the East Regional in 2014. Let's check out the sites, and I'll give you my analysis. I'll get to the Garden news in a moment, but overall, no real surprises with the exception of KeyArena hosting a subregional in 2015 because we all know how about that venue was, according to the Sonics, not fit anymore for the NBA. But I am left wondering if that is anticipation of a new arena in Seattle that has been rumored. 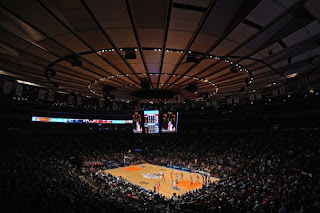 But for the news that Madison Square Garden will be hosting tournament games for the first time since 1961, it is pretty cool to have tournament games at the Garden. I discussed back in March that MSG was in the mix to host the 2013 East Regional as well as the Barclays Center in Brooklyn, the Prudential Center in Newark and the Carrier Dome; the regional was later awarded to Washington, D.C. It seems like the NCAA has been looking to get the tournament to MSG at some point, with the renovations being made to that historic building making it even more attractive for a regional at some point.